A growing number of Chinese are choosing to travel during the Spring Festival holiday thanks to the country's economic growth and consumption upgrading, which have pushed per capita GDP closer to $10,000. By using innovation to make cultural sites and products more attractive, some traditional tourist attractions have increased their profits. The 600-year-old Palace Museum (Forbidden City) in Beijing, for instance, has capitalized on the popularity of a documentary film, Masters in Forbidden City, and is selling cosmetics with traditional design, including lipsticks and eye shadows. In addition, some historical sites are attracting more tourists, mostly young people, by using social media and new techniques. Xi'an, capital of Northwest China's Shaanxi province, is a historical city and home to the Terra Cotta Warriors, a UNESCO World Heritage Site. Apart from using traditional media, Xi'an has also embraced Douyin, a short-video sharing social media app, to further spread its popularity. Which has proved very effective, as the city's 2018 tourism revenue and tourist footfalls grew 137 percent and 66.6 percent year-on-year, both the highest in the country. Innovation has helped the Palace Museum and the city of Xi'an to not only make more profits, but also spread traditional Chinese culture by drawing the attention of an increasing number of youths. Besides, Asian countries are still high on the must-visit list of Chinese tourists, with Thailand being the most popular destination. Which isn't surprising because compared with their Western counterparts, countries in Asia have similar cultures, lifestyles and values. 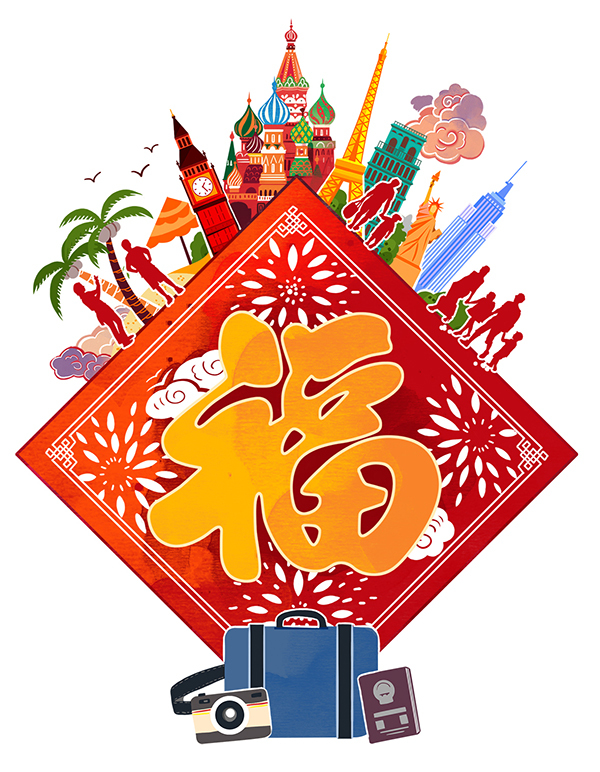 Also, since the Spring Festival holiday lasts only a week, many prefer to visit a place nearby to enjoy a relaxed vacation. Southern cities such as Sanya, in the island province of Hainan, are still the first choice for many Chinese people to spend the Spring Festival holiday as the weather there is warm this time of the year, while traveling north to enjoy the views of snow-capped mountains and clear blue skies has become a new trend. Harbin, capital of Northeast China's Heilongjiang province, for instance, has become one of the most popular tourist destinations in the country during Spring Festival, with the Ice and Snow World contributing to 50 percent of Harbin's total tourism revenue. To enable more tourists from Shenzhen, Guangdong province, and other southern cities to appreciate the amazing ice and snow sculptures, Harbin has chartered 50 seats a day on flights from Shenzhen until March. The growing revenue will help Harbin to not only maintain its lead over other Chinese cities as a tourist destination during Spring Festival but also improve infrastructure, including skiing facilities, and cultivate talents. Winter sports, too, have become increasingly popular in recent years, especially after China won the bid to host the Winter Olympic Games in 2022. In fact, thanks to the popularity generated by the Beijing 2022 Winter Olympics, the winter sports industry is expected to reach 600 billion yuan ($89.33 billion) by 2020. Moreover, better transport links can enable people to travel much more easily and thus boost the tourism industry. For example, the high-speed rail link to Kunming, capital of Southwest China's Yunnan province, has significantly increased the number of tourists visiting Kunming for short trips from nearby provinces. And thanks to the high-speed rail link, tourist footfalls in Kunming increased about 14 percent year-on-year from January to November 2018. Tourists taking the high-speed train accounted for about 40 percent of arrivals, an increase of 76 percent year-on-year. The growth in the number of Chinese people traveling abroad can be partly attributed to the increase of countries allowing Chinese tourists visa-free or visa-on-arrival travel provisions－from 60 in 2017 to 74 in 2019. A growing number of Chinese are choosing to travel during the Spring Festival holiday thanks to the country's economic growth and consumption upgrading.